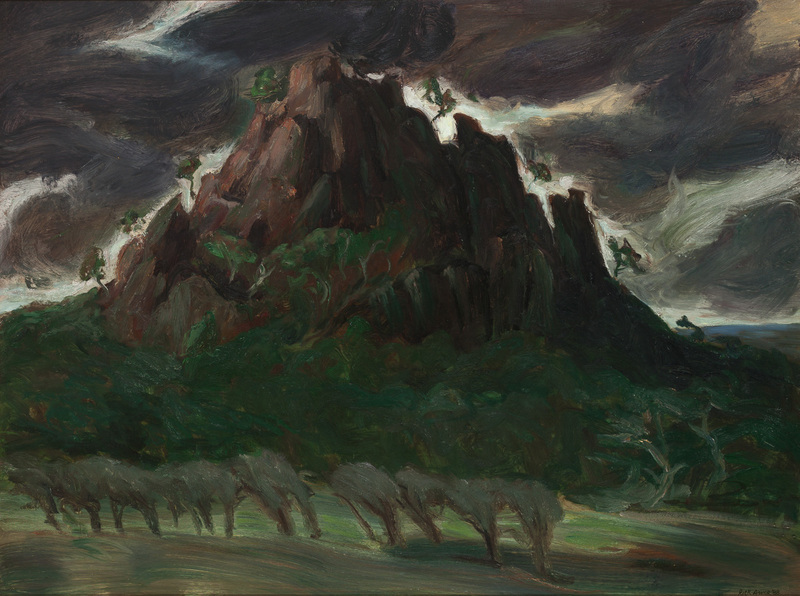 This stormy, brooding vista of Hanging Rock took it origins from a time Amor was undertaking an in-school program at Kyneton. Daily he would drive from Cottlesbridge to Kyneton along the Lancefield Road directly towards the rock. One particular occasion resonated with the stormy weather, lighting and atmospherics engulfing the rock and he pulled over and made a drawing on the back of an envelope, the precursor for this painting. Amor enjoyed a long friendship with the Daryl and Joan Lindsay’s family and had visited the rock during the making of the film ‘Picnic at Hanging Rock’ with Joan, the director, and had painted the site in the past. The execution of the painting was at a pivotal time in Amor’s career and is the last of his expressionist work.